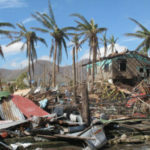 Last November, the Philippines was devastated by the strongest, deadliest typhoon in the nation’s history, the most powerful to make landfall anywhere ever. 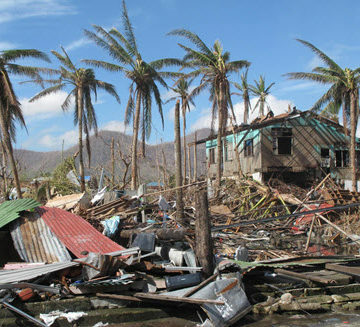 With wind speeds reaching 195 mph, Typhoon Haiyan killed at least 6,200 people and affected 11 million total, leaving many homeless. 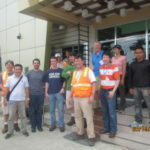 On Saturday, May 3, a team of 7 civil engineers from ASCE’s Technical Council on Forensic Engineering, in cooperation with the Technical Council on Wind Engineering, left for the Philippines on a week-long mission to conduct post-disaster assessments, documenting evidence of structural and geo-system damage to historic and residential structures and public infrastructure. 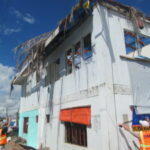 The specific objectives of this project are two-fold: 1) to collect perishable data on wind- and water-damaged structures from Typhoon Haiyan and correlate the data to the storm surge level from the coast to inland; and 2) to develop the framework and recommendations for future improvements to ASCE-recommended design and construction practices, including those specific to the forensic community regarding inspections of damaged structures. Among the team is a specialist in building condition assessments, Mark E. Leeman, P.E., M.ASCE, vice president of Facility Engineering Associates of Fairfax, Virginia, who chronicles the team’s experiences in this exclusive daily report for ASCE. Saturday and Sunday May 3 and 4, were travel days for the team. With the length of flights and time difference from the U.S., it took most of two days to get to the Philippines. Most of the efforts associated with the project to date have involved travel planning, logistics, and understanding the nature of the storm event whose after-effects we were travelling to study. Shenen Chen, Ph.D., P.E., M.ASCE, professor in the Department of Civil and Environmental Engineering at the University of North Carolina at Charlotte, led efforts for the ASCE team. With the arrival of Monday morning, the business of the trip started in earnest. In the morning, the team members were able to congregate for breakfast and begin to get to know one another. Discussions of technical backgrounds and specialties came up as each team member described their areas of specialty. I began to see that a real diverse team of wind and water experts had been assembled. The next stop was to meet our hosts at the Philippine Institute of Civil Engineers (PICE). At the meeting, we met current PICE board members and ASCE representatives. Potenciano Leoncio, Jr., Ph.D., P.E., M.ASCE, past chair of ASCE Region 10, and past president of ASCE Philippines was a gracious host. At the morning meeting, we heard two presentations on preliminary studies of Typhoon Haiyan and the damage in the Tacloban area. Detailed technical presentations were prepared by Filipino engineers who had studied the event and participated in early study teams that had travelled to the area. A luncheon of traditional Philippine food was a good opportunity to socialize with our hosts and get to know them a bit better. Nannette Villanueva, Aff.M.ASCE, from PICE is filling a special role for the team’s presence in the Philippines. She led all the in-country efforts to coordinate the trip—travel logistics, transportation, hotels, and interpreters. We are very thankful for all her efforts. Grounds at the Manila American Cemetery and Memorial. Photo Credit: Mark E. Leeman. On the way back to the hotel, Nannette arranged for the team to visit the Manila American Cemetery and Memorial. This is one of the overseas memorials to America’s World War II dead and is a truly remarkable site. The site is absolutely peaceful and solemn, which was somewhat strange, as it was located in a very urban and developed area of Manila. I was very glad Nannette arranged this stop for the team. It was an appropriate way to start off the trip, by remembering the sacrifice of those who gave their lives in the war. To find out what happened on Day 2, read the next installment of Technical Notes. Mark E. Leeman, P.E., M.ASCE, is vice president of Facility Engineering Associates of Fairfax, Virginia.